I LOVE the holidays, so naturally of course I needed to create this list of Christmas & Holiday themed art journaling prompts! I’m happy to bring you this list of 30 holiday prompts perfect to keep your spirits jolly all throughout the season! This time of year it can be hard to find some time for yourself for you and your art journal, but I think that’s all the more reason it IS important to find some room for creative expression! I know some people dread all the rushing and chaos and the commercialism (and sometimes even the controversy) surrounding the holidays…but I LOVE IT! I’m like a kid on Christmas morning from about November 1st through January! All that stress and chaos will melt away while you take a few moments to create…it is seriously a gift you can give to yourself to give yourself some time and space to be creative! 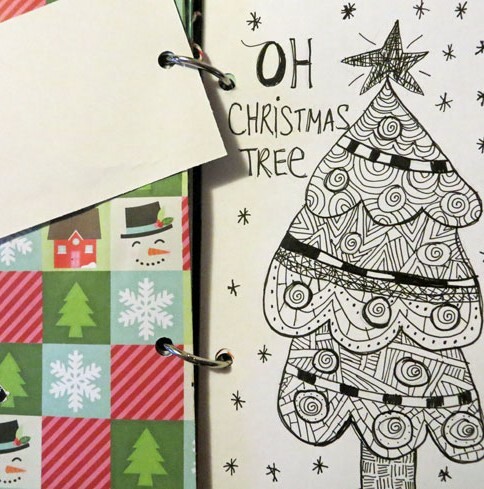 Here are 30 Holiday Themed Journal Prompts to Keep You Inspired! Hopefully these will get you in the spirit of the giving season! Whether it’s “Silent Night” or “Blue Christmas” or “Rudolph the Red Nosed Reindeer” – pick one of your favorite holiday songs and illustrate it. I could fill a whole journal full of all the songs I like! There are many different ways to do this. You could cut out paper snowflakes, You could doodle them, paint them, make them out of popsicle sticks…the possibilities are really endless! If you want to add some sparkle to your snowflakes, I recently learned from a fellow art journaling enthusiast that glitter nail polish works nicely as an alternative to traditional glue and glitter. You don’t have to go out into the cold to build a snowman, you can always paint/draw/doodle one! You can make one or many. There are countless quotes on the different winter holidays, and each of them can be a great place of inspiration for a page (or several pages) in your art journal. I love the saying “Your presence is a gift” – and this time of the year always makes me feel thankful for the time spent with family and friends. Create a journal page inspired by the word presence and the people who have been a gift to you in your life. Paint/Create a winter scene of evergreen trees, or decorate a Christmas tree. I’ve seen some really cute examples of trees made out of twine, ripped out book pages, buttons, and more. You can also always just make simple doodles! Make a mixed media painting or collage of Saint Nick or Santa Claus in your journal or write a list of reasons to believe in Santa Claus. I know nothing about astronomy, but to me it seems like the stars shine just a little bit brighter in the winter months – maybe because of the days getting darker longer. There are also many references to stars in many different holiday stories…making stars is a great source of inspiration for a journal page! This season it’s quite popular to exchange gifts with friends and family. Make a page about what giving means to you. What are some of your holiday traditions? Create a page about the ones that are the most meaningful to you or create a list of traditions. The holidays are full of colors and patterns. Choose a few of your favorite color schemes and use these colors on a page or two in your journal. Is there a favorite book or movie or character for the holidays? Perhaps you could illustrate a scene from your favorite book or movie or create your own character. Everyone knows hot chocolate is best enjoyed in the winter months. Make a page of a warm cup of hot chocolate! A Christmas village is what inspired the cover of my Christmas holiday junk journal! It’s so fun to see the different ways cities and towns decorate for the holidays, and it’s a great source of inspiration for different things you can draw/paint/collage into your journal. Santa makes his list and checks it twice…so have you been naughty or nice this year? What are your wishes and wants for the holiday season this year? You can write a letter to Santa, make a wishlist, or write about peace on earth. Did you save all your holiday cards from last year? Use them to create a collage or tell a little story about the pictures and images in them. You can make Found Poetry in your journal by cutting out holiday themed words and phrases from books and magazines. You can also of course write your own poem, or illustrate one of your favorite poems in a page in your journal. Draw or Paint or Collage a page in your journal of your favorite toys or invent your own toys for kids to play with or pretend you own a toy store. Do you make cookies or other special treats for the holidays? Include a page in your journal of your favorite recipe or add some pictures of things you’d like to make. What does it mean to you to have the holiday spirit? What are some ways you can show that holiday cheer and spirit and share it with others? Write about or illustrate one of your favorite memories of the holidays as a child. Compare it to what it’s like now that you’re an adult…do the holidays still hold the same magic and meaning for you? Charle’s Dickens wrote about the ghosts of Christmas past, present and future. Create a few pages in your journal about the past, present, and future you. Do the holidays make you feel stressed or sad? Create a list in your journal of ways to help lift your spirits during the winter months. 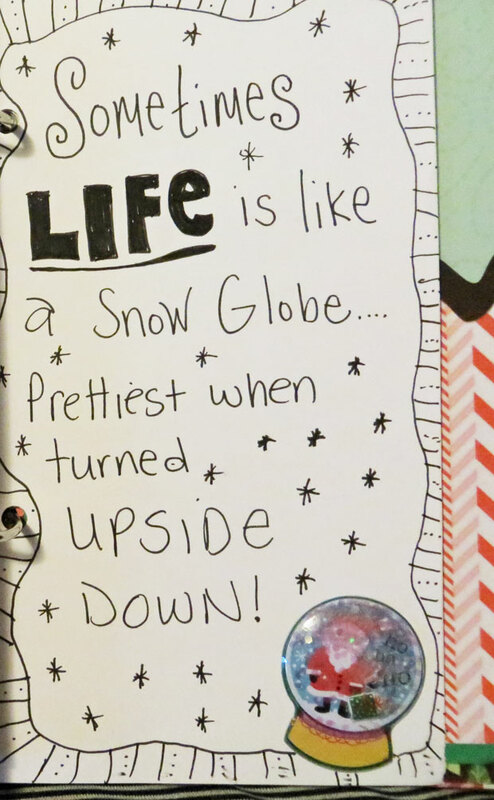 That’s what inspired this “life is like a snow globe” doodle below! This time of the year is a great time to get involved or donate to a cause you are passionate about. Make a page in your art journal about what causes you support and how you’ve helped them this past year. What signs of winter do you see outside your window? What are some of your favorite winter activities? Do some research on how different countries celebrate the holidays and create a page about the ones that interest you the most. You could also create a page about different places in the world you might like to visit at Christmas time. There is a big thing about Ugly Christmas Sweaters (people throw parties for them and everything, I am not making this up!) – so why not try your hand at designing some of your own ugly Christmas sweaters in your journal. Try creating a border in your journal of Christmas lights. How did this past year treat you? What are some of your favorite memories about the past year? How will you be celebrating New Year’s Eve? 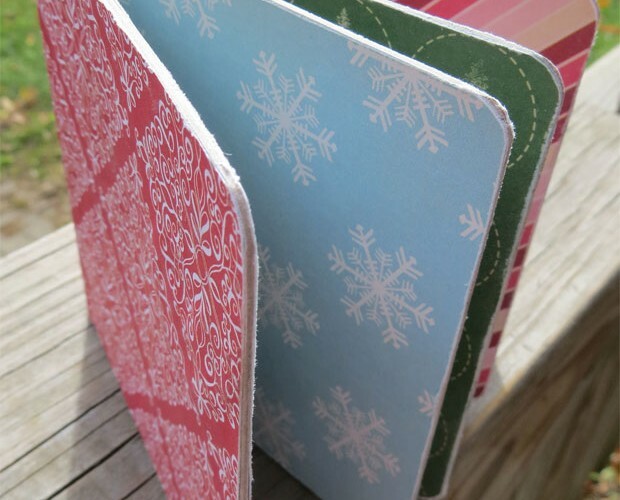 I hope some of these holiday and winter themed journal prompts inspire you this season to create something marvelous! You don’t have to do all of these prompts of course, and some of these could be expanded on to make entire journals/books out of them…but at the very least they should get you thinking about your creative holiday spirit! If you make anything using one of these prompts, I would love to see what you might create! Please do join our Facebook Group to share your art journal pages! And if you have any ideas for other prompts feel free to share – I’d love to hear your ideas in the comments section as well! This is a wonderful list for art journaling during December, thank you! Thank you, that was nice ideas, I will use more than one. Thank you so much for the wonderful ideas…you are truly creative & giving! This has been most inspiring; however, I now have a conundrum: which one shall I do first?!? Thank you for all of your wonderful posts.